This post collects live and radio performances by Les Rumeurs not included in earlier posts. 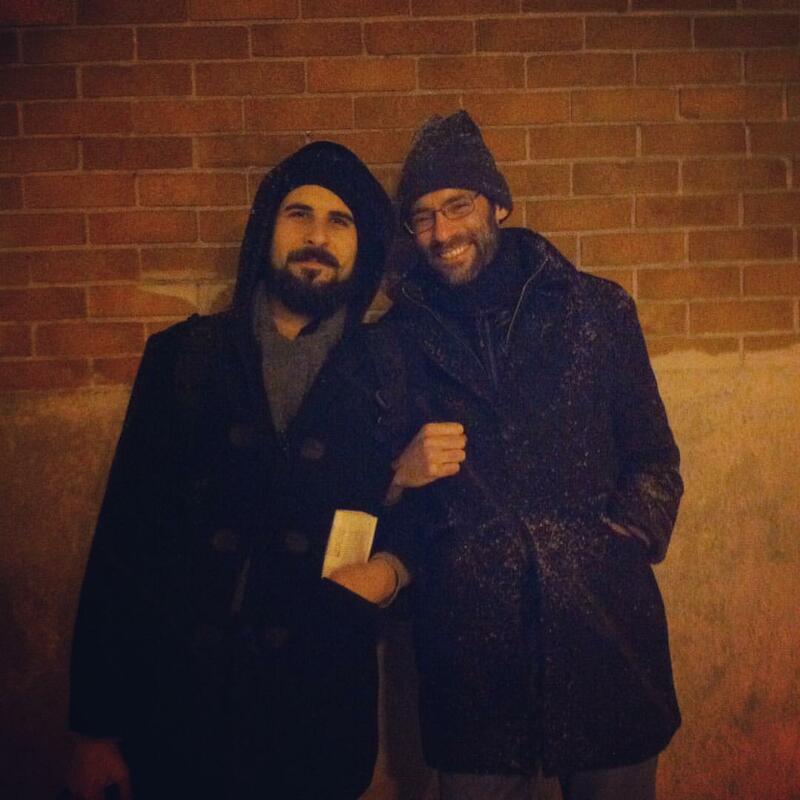 I first met Stefan Christoff, a well known local organizer / activist / writer / musician in Montreal, during Occupy. It was Fall 2011 and I was finishing up my MA thesis at McGill, postering for Media@McGill events for a little extra money. Stefan was postering too and we crossed paths at Casa del Popolo, if I remember correctly, a local institution. He invited me to an upcoming Howl Arts show at La Sala Rossa across the street. McGill’s support staff employees were on strike at the time, and student activism was building on campus, especially among the rad undergrads. In the spring (Printemps érable) the GGI of 2012 happened, and both Stefan and I often had our recorders out. I left Montreal in late May and returned in late September, at which point the situation had calmed significantly.While the manifestations were still going, after the electoral victory of the PQ there was a strong push by the political elite to declare the movement finished. The weight of police repression and unconstitutional bylaws restricting protest had taken their toll as well. The black bloc presence was felt stronger than ever, and the likelihood of kettling and arrest contributed to a diminishing broader support and attendance. At some point in the fall of the next year, after depressing public debates about a racist Charter of Values and other distractions from the continued austerity policies of the states, Stefan and I were hanging out and chatting over coffee and reflecting on the strike when the idea of doing something with our recordings came up. We floated the idea of working together, and decided to produce something for radio. Stefan sent me some recordings from the strike, along with unused outtakes from a piano duets album he recorded in the early mornings during the strike. I chopped these up, made some tapes loops, improvised some patterns on an old Electribe sampler, and edited down a mess of improvisations into a 20 minute radio piece for CKUT’s Radio is Dead show. Stefan and played together in the same room for the first time preparing for that show at Cafe Resonance inl April 2014 during the Howl Arts festival. I used the Electribe and a few tape players, Stefan played piano, and our friend Norman Nawrocki added some haunting violin. Though there were some really nice moments, it was a completely different experience from the recorded works. and we were still figuring out how to interact in a live context. Before playing together a second time, in June 2014 at Cagibi, we got together for a couple practice sessions, deciding to reconsider out approach to the material, allowing us to be truer to the composition while allowing room for spontaneity and reinterpretation. Because the venue we were booked at no longer had a piano, Stefan decided to switch to electric guitar, while I used laptop and mixing board with outboard effects, including a bass amp in addition to the PA. We were both very pleased with the new direction, and happily were able to get together to do it again before the year’s end. Since it’s so rare to hear Stefan shredding on the guitar, we made sure to actually record this show. On top of that, La Plante has a beautifully beat up piano that Stefan got some lovely tones out of. The other artists included Le Berger, Sam Shalabi, Francesco De Gallo, and Guillaume Vallée. I moved to Minneapolis in the summer of 2014 to begin a PhD program, and so Les Rumeurs has since been less active. We played at La Plante in December of 2014, and so when I was next in Montreal, in December of 2015 we decided to develop something new. We conducted a live duet soundscape presented on CKUT radio on Dec. 30, 2015, in which I played synth and electronics and Stefan played acoustic guitar. I manipulated sounds of commuting and public transportation that I’d recorded across the world, including Minneapolis, Montreal, Vancouver, Mexico City, Rome, NYC and beyond. I also used sounds from a New Jersey printing press factory where my father worked for decades. Finally I used samples to local police radio. The result is a kind of sonic meditations on work, time, transportation, and everyday life. In June of 2016 we played another show at La Plante featuring old and new material. Other artists who performed were Cop Car Bonfire, Anarchist Mountains, Ylang Ylang, and Temple Volant. Later in the week I joined Stefan for an impromptu live in-studio soundscape performance of entirely new and improvised work. I triggered and manipulated a series of field recordings taken different places throughout my travels, stefan accompanies on acoustic guitar. all recorded in studio at ckut radio in montreal. On a cold morning in Montreal, 22 December 2017, Stefan and I reunited to improvise some music live on radio. Stefan plays acoustic guitar, ebow, and peels a small bell, while Joseph plays pocket synth and manipulates field-recordings, including waves slowly crashing on rocks, the sound of the snow plow, and someone practicing trumpet on Rome’s Aventine Hill. The opening track is entitled “Clock Out” and the final track “Winter Walks pt. i,” both from temps du travail, syncopé (forthcoming). That album consists of edits culled from two live sessions we did together in January 2016 preparing for our radio and live performances that year. Hopefully more information on that release soon. Excerpt from a live set we played at a Howl! event Holograms + Sound that took place in Montreal on 27 Dec. 2018. We used synths / acoustic guitar / bells / piano samples and field recordings, including an excerpt of a speech by Michel Chartrand from the film ’24 heures ou plus’ by Gilles Groulx, also Stefan talking about a deportation from the U.S.